Children, defined by their young age, just want to play around and have fun. It is also a critical stage of their life that most of the things they see, do or played with can affect in the development of their logic and skills. The ideal way to cater to fun and development is by providing them with educational toys. Educational toys needs not to be filled with advance technological features because kids at a young state of mind would not really appreciate and learn from it. That is why a wooden toy trains are the one preferred by most parents and professional educators due to its classic style, simplicity, reliable durability, sturdiness, health and kid friendly, non-choke hazard and more. A wooden train set or toys are considered to be a practical investment for your kids. Most of it is easy on your budget or highly affordable. It can teach your kids silently with how things works and most of the basics such as color identification, letters and numbers, familiarization and more. It also improves certain set of skills such as problem solving skills through connecting and assembling, logical and reasoning skills, hand-eye coordination, fine-motor skills, etc. There are some advantages and disadvantages of having a wooden toy set but it’s sure to be more on the positive. Trains are the usual choice for a wooden toy. It is possible that wooden train toys are more into the fun spirit of a child. Most adults even agree that train brings back wonderful and touching childhood memories. Train toys have inspired so many kids and have grown to be on the right stage of mind. In most cases, it has inspired and motivated children to be more creative, innovative and expand their imagination. The benefits comes in a long list, you should consider getting your child a set of their own. This is the Orbrium Toys wooden toy train set for kids. 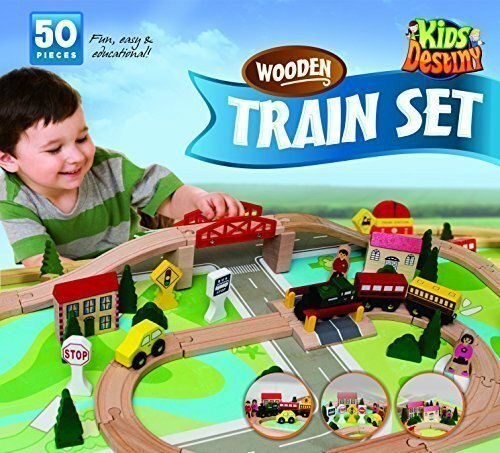 The set includes 100 pieces of train fun and accessories, all made of durable wood. It is a complete set with all the necessary figures, infrastructures and cars to allow your kids to have a more imaginative play. This set works great to be laid out on top of a wooden train table. Each piece is large enough that you would not worry about it being choke-hazard for your kids. The next wooden train sets for kids is also made to you by Orbrium Toys. This one however, is much smaller than the previous set. 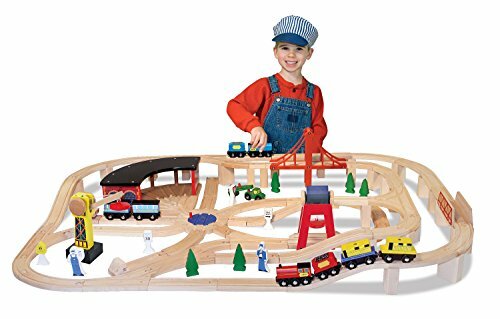 It only includes 52 deluxe wooden pieces but includes all the necessary accessories for your kids to be able to build their ideal city train experience. It requires some assembly with the wooden tracks and is actually a great way to develop your children’s skill by connecting each piece. This is all available for a price that is way beneath your budget line. This is the Melissa & Doug Railway set. 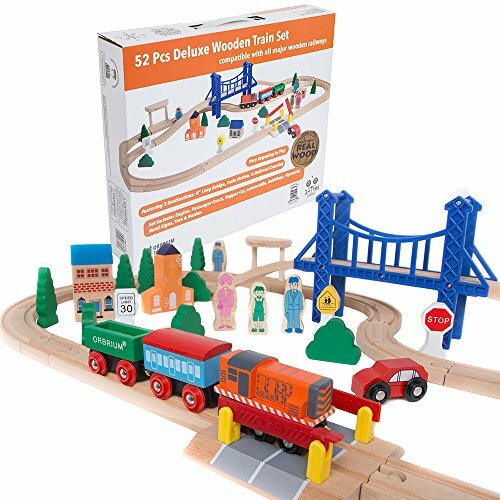 It is a set of 130 plus pieces which includes its own wooden train tracks for kids. The set is larger and is complete with all the necessary tools and accessories to provide a great imaginative role play for your kids. A set like this is preferred for most beginners as it saves you the trouble of trying to individually purchase the required pieces to set up a city themed train set. It could go perfectly on top of a strong and sturdy train table. It uses real durable wood. Each piece of this set is built with great construction and sturdiness. The next would be pieces of wooden train cars. 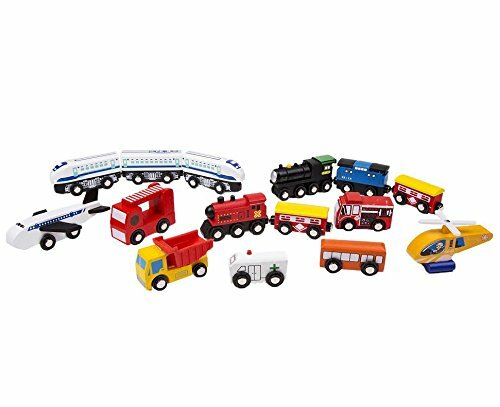 These train cars are perfect to add more fun to your existing wooden toy train set or could also act as a replacement for broken, damaged or lost train cars. 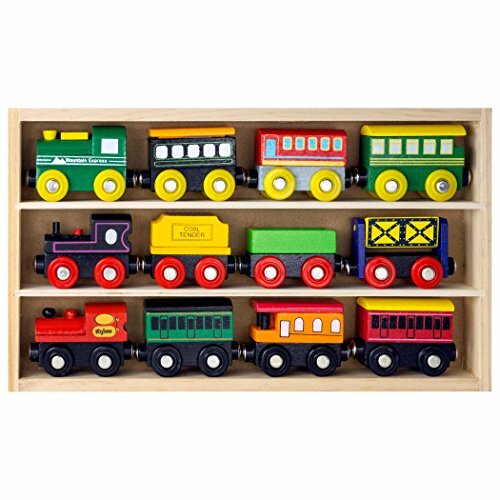 Each of this amazing and colorful train cars are a perfect fit on standard wooden train cars from popular brands such as Chuggington, Brio and Thomas. There are also metals and magnets installed at both ends of each train cars as seen in the picture. This is to provide more comfort and make connectivity more fast and efficient. This is a classic wooden toy train set from Melissa and Doug. 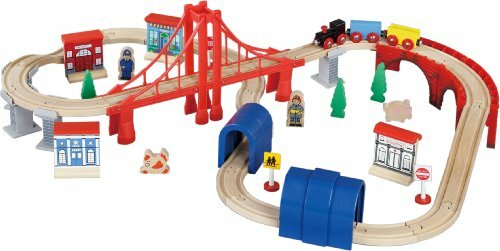 The set includes 20 durable wood pieces which includes a bridge track. It features a small sized wooden train track that forms a number 8 figure if connected. There are also two train cars which have magnets and metals on both ends making it versatile. Although smaller in length, you can easily add some train cars with the same type of coupling for you to extend the fun of your kids. The set is good for children aging 3 years old and up. It is built with long lasting sturdiness. The set, being simple, looks very awesome and cool. This will provide your kids a great amount of entertainment and promisingly long hours of fun. 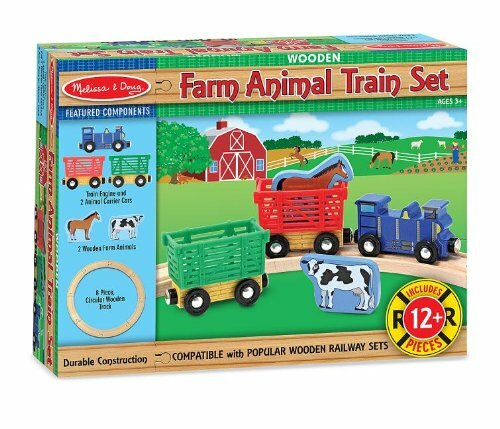 One of the many classic wooden trains for toddlers from Melissa and Doug is this animal farm train set. The box is comprised of 3 wooden train cars, one train wooden engine car and two animal cars. There is two pieces of animal figures, a horse and a cow, to where you kids can load up to the back of the animal car and ride them around the circular track. 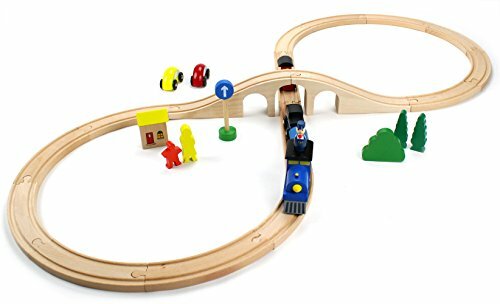 8 pieces of wooden train tracks built with smooth and durable finish forms the small circle track. 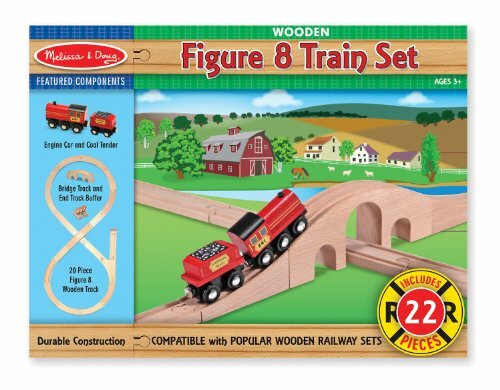 This set is highly compatible with most popular wooden train brands. 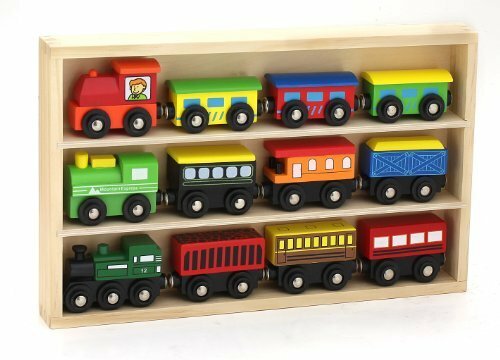 These wooden train cars come in a nice wooden box or frame. It is 12 pieces of wonderful train car collections and wooden train engines. It can be a great collectible item for adults train lovers and exciting pieces of train toys for kids. Children can have this to be added on their train cars for more detailed theme for their existing wooden train set. It can open up a wider imaginative play and tend your kids to be more creative. It is compatible with standard tracks and can easily connect with other wooden train cars. This is an animal wooden train set. It is a simple set that features a wildlife or safari animals. The set is with great compatibility over other wooden train set. It is also very affordable and not that hard on your wallet. Open your children’s mind into the wonders of wildlife animals. This can let them slowly learn how to identify different animals. They can have a great time loading each animal figure on the back of the animal carrier car and ride them around the wooden tracks. There are also assorted types of wooden vehicular toys that go along with the concept of a wooden toy train set. This is a collection of 15 unique cars and train engines. This could work perfectly to complete your children’s collection of wooden toy cars that they usually lay out to add more flavor and attractiveness to their train set. The train engine cars included can also connect easily with other wooden train cars that have the same magnetic couplings. This is Thomas the train, made and brought to you by Fisher-Price. The Fisher-price company is known to have created so many Thomas train sets, most of which are made of strong and durable wood. There are easy to use magnets installed at ends of the train. 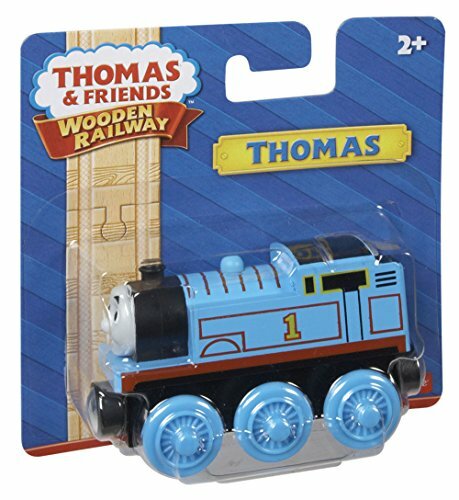 This will work great for your children’s Thomas and Friends wooden set but could also do well with other train themes as long as it can connect via magnetic couplings. This is one of the proudest wooden trains set creation of Maxim Enterprise. The set features 2 wooden train cars and a train engine car. It is a 60 pieces set which includes strong wooden train tacks with a suspension bridge to have a more unique, elevated lay out. You would actually get everything that you see in the picture. The set requires some work with assembly but fortunately, Maxim Enterprise included a well detailed instruction manual for efficient connectivity. The next one would be a simple wooden farm set from Melissa and Doug. It is filled with bright and lovely colors which is attractive to a little kid’s eyes. 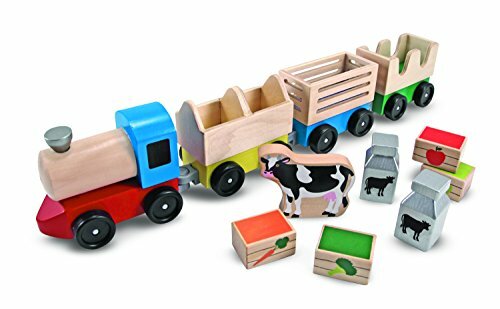 It includes a wooden engine car and 3 train cargo cars for your kids to load up the cow animal figure and the blocks of milk and fruits. It is affordable and easy to acquire. This is best for children with ages 3 years old and up. The set can be used to discreetly teach them about animals, farms, color identification and numbers. 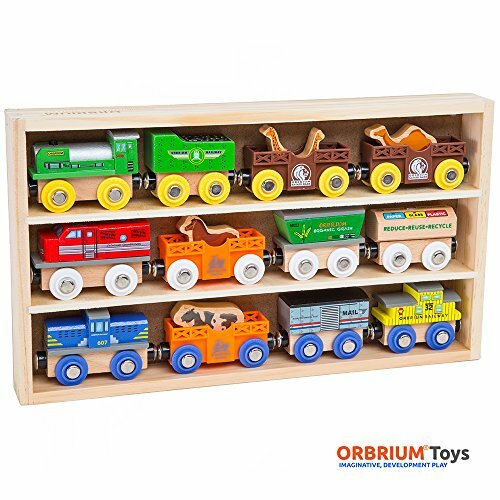 This is a collection of wooden train toys from Orbrium Toys. It comes in a simple yet elegant wooden box or frame. The set includes 12 pieces of wooden train cars and wooden engine. You can have this for your kids so that you can try to expand their current layout and provide them with a wider option to be more creative and imaginative. Each train cars are brightly colored and comprehensively detailed. You can have this all for a small and reasonable amount. 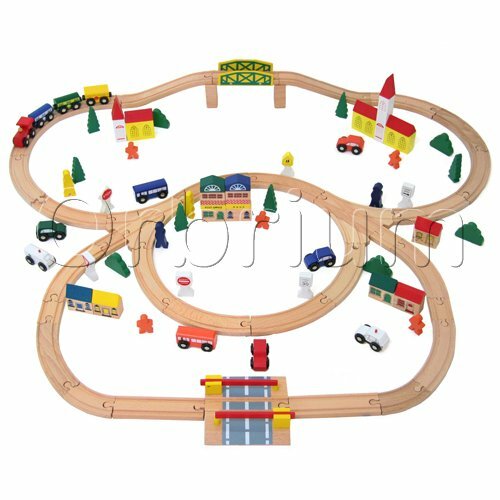 A simple double loop wooden train set and track lay out from Kids Destiny. It uses a standard size train track but all of the pieces are made from beautiful and durable beech wood. The train’s structure is built to last long and serve many generations. It is very hard to break. The tracks have a bridge to add some elevation and uniqueness to the lay out. The set is child-friendly. It has passed several safety and security test using US standards or requirements. 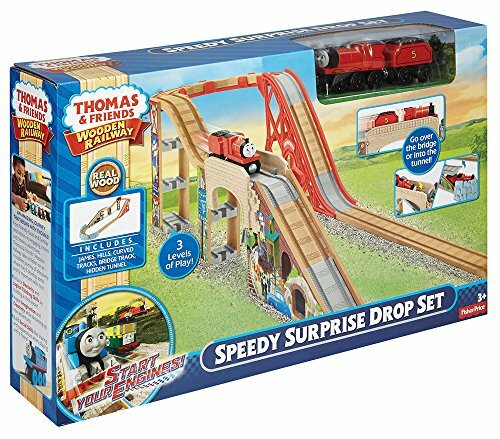 This set is from Fisher-Price that features a Thomas wooden toy train set. One of the great features of this set is with its tracks. It uses a unique and complex track layout where your kids enjoy several layers of elevation. Thomas the train will travel up and down the tracks with a nice and consistent flow. The train toy and the tracks perfectly fit each other. You’d see less or zero derailing as it climbs up and down the tracks. 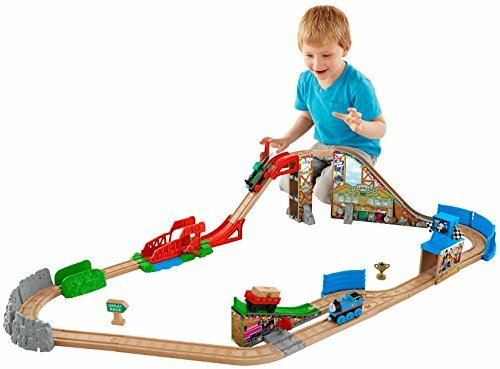 Another unique layout of wooden train tracks for kids, brought to you by Fisher-Price, the Thomas and Friends Railway wooden set that features Percy. Percy the train is one of the famous character and the children’s beloved train series, Thomas and Friends. This train durable and highly constructed train set has a helipad and a helicopter at one end where the train passes through and a tunnel house on the other end. 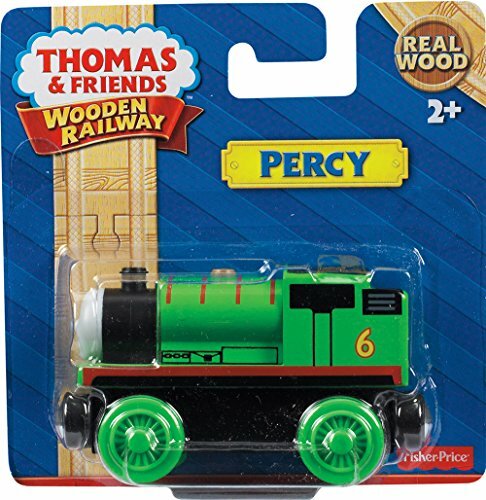 The set includes an animal figure, a crate and 2 train cars that connects just about right on Percy’s back. As we all know, colored wooden blocks are the most famous children’s toy at a very young age. Blocks are usually large that is ideal for a toddler’s toy. You would not worry about your kid choking with his or her toy. This type of wooden trains for toddlers of Melissa & Doug caters the need for child development. Assembling each block and placing them in a pole will greatly increase their object or shape identification skills, reasoning, logic, color identification and other children developmental skills. 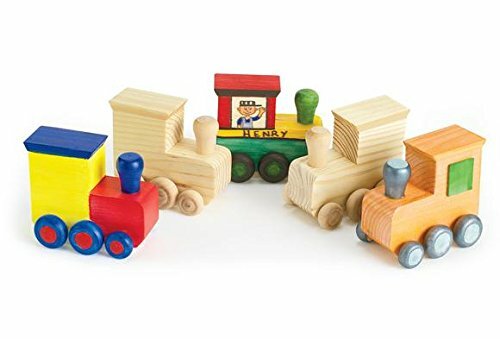 Being said earlier, Fisher-Price is known to create so many Thomas and Friends inspired wooden train sets. This is the Race Day wooden railway set that offers a racing theme for your kid and his friend. There are two engine train cars included, one is Thomas and the other one is Percy. The tracks are fairly large in dimension which makes it great for a two child play. The tracks are also versatile. The bridge can be lowered for a two direction train route. This is Percy, a wooden toy train set inspired from the children’s train series, Thomas and Friends. It is made with the credibility of Fisher-Price. It comes in single train piece and of an affordable price. It is wonderful to have if you want to expand your children’s train world of Thomas and Friends. The toy is built with realistic design and great aesthetics. It is also reliably durable and sturdy. It has an easy-to-use magnetic couplings installed both ends. 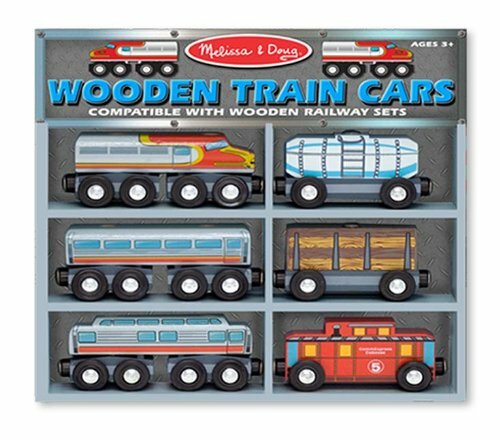 This is the Melissa & Doug’s wooden toy train set cars. The set comes in a nice glossy wooden frame. It has a total of 6 train cars that is compatible with other wooden railway sets. It is great for ages of 3 and above. Each piece connects easily with each other due to the magnetic coupling system used and installed at both end of the train cars. It is a nice collection for your kids as they will be granted with more imaginative options. It is an advantage if your kids have plenty of train cars to choose from. It really won’t cost you that much if you give them a wooden train car collection. These 12 pieces of wonderful and colorful train cars is from Playbees. It is packaged or enclosed in a nice rectangular wooden frame. It is loved by most train adult hobbyist and works for an additional train car option for kids. It has strong magnetic couplings. The wood used is high quality and it is most likely to be compatible with most popular wooden railway brands. Another animal themed train set from Melissa & Doug, the zoo animal train set. 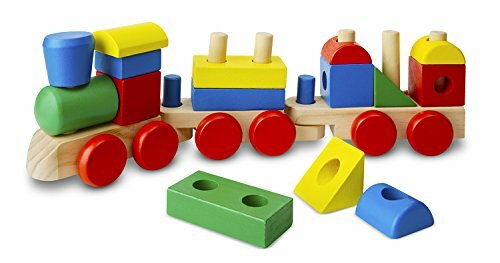 It includes a wooden train engine car and 12 other pieces: 8 durable real wood train track pieces, 2 wooden zoo animals and 2 train animal cars. 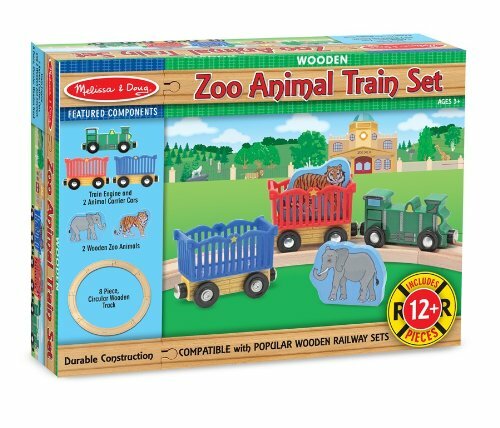 It is affordable, the same as other animal themed train wooden set from Melissa & Doug. The tracks form a small circle which only requires simple and basic assembly skills. This is a figure-8 train wooden set from Conductor Carl. It has a simple train track lay out that forms a number 8-figure with a cross bridge on the middle/intersection. Although it uses a simple 8 figure train tracks, it is of an average size. It has a total of 30 pieces: 12 curved train wooden tracks, 12 assorted figures and accessories, 2 wooden bridge pieces, 2 straight tracks, 1 Conductor Carl figure and 1 wooden train engine. The last one our list of amazing wooden toy trains would be a decorate-your-own train made of wood from Colorations. This allows your kids to create their own design on each block of wooden train car. It will enhance their imagination, art skill, color identification skill and creativity. It is made from real and hard, solid wood. The train cars are also sized with the standard train wooden tracks to be more playable and versatile.